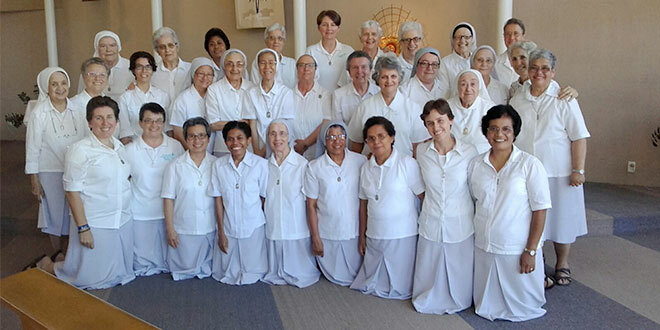 Faithful together: Sr Melissa Dwyer (front left) with other members of the congregation of Canossian Sisters. THE more I reflect on the call to follow Jesus as a consecrated woman, the more convinced I am that religious life is just as relevant and just as essential to the Church as it has ever been. Now more than ever, the Church needs young people who are ready to witness with the totality of their lives that Jesus is the most important thing for them. Now more than ever, the Church needs young people who are ready to stand for their faith, irrespective of the challenges that they face. Now more than ever, the Church needs committed people who are ready to risk everything for Christ and be open to go to the ends of the earth to serve those in greatest need. Many young people desire to make a difference in the world. But perhaps they don’t realise that religious life is one concrete way of doing that. Opening your heart up to the unconditional love of Jesus and having the courage to push away from the shore with Jesus sets you on the adventure of a lifetime. Religious life is an opportunity to grow each and every day more in love with God, whilst living in a community of other religious who are also striving to follow Christ wherever He leads. The vocation to religious life is ultimately about an encounter. It’s about a life-changing encounter with Jesus that transforms the heart of someone. Once we meet Jesus and He speaks to our hearts, we are never the same as before. What’s even more exciting is that religious life provides the avenue to have a daily transformative encounter with Jesus, allowing Him to stretch and mould us in whatever way He desires. When speaking about religious life, Pope Francis said, “The Church and the world have need of this testimony of the love and mercy of God shown by religious. With the world rocked to its core by terrorism and threats of war, religious life becomes a sign of hope and joy in the midst of despair. In the midst of so much negativity that surrounds the Church, I believe living my life as a religious sister is a privilege. It is a privilege to be able to serve the Church. It is a privilege to be able to live my life completely for Jesus. It is a privilege to live with a community of other women on a mission of making Jesus known and loved. Sometimes when we hear the word “vocation” we think that one has to be perfect to even consider embarking on the journey of religious life. One of the saddest things is that many young women feel a call to religious life but never have the courage to give it a try. Attuned with a society that to a certain extent is afraid of commitment, young women sometimes miss the opportunity to take the first step of exploring a religious vocation. Whilst sometimes it can be difficult for a young person to discern which congregation to join, there is a certain inner peace that comes when one is in the right place. There’s no need to have all the answers at the beginning. When I first entered religious life I had no idea of what this vocation was really all about. Yet I continue to appreciate the beauty of the daily journey of sitting at the feet of Jesus and discovering more about His call to follow. The vows of poverty, chastity and obedience give me opportunities to grow in freedom from possessions, love without measure and complete trust in God’s will for me. At the end of it all, I love my life as a consecrated woman. I love the opportunity every day to be available for whoever God calls me to serve. I love the opportunity to witness to my faith, even without words. I love the opportunity to ground my life in prayer which invites me to allow my relationship with Jesus to transform my life. I would never have expected my life to turn out the way it has. Yet it’s exciting to dream of the possibilities ahead of me in continuing to love and serve God with all that I am. We each have one life to live. I want to make sure that I use every possible moment to spread the Good News. In whatever opportunities arise I want to simply do the very best I can in deepening my love for God and allowing this love to transform the world. If you want to make a difference, if you want to serve the poor, if you want to be radical in responding to the great gift of faith you have received, consider religious life. It’s a radical adventure of a lifetime. Where are you going? Follow Jesus. He is more than enough. Sr Melissa Dwyer is a Canossian Sister from Brisbane. She works for Vocations Brisbane. To find out more about religious life, contact her at srmelissafdcc@gmail.com.